Gemalto, a provider of digital security, is expanding Industrial IoT connectivity with a significant breakthrough in wireless engineering – the industry’s first IoT module to provide global connectivity on 12 LTE bands plus, 3G and 2G cellular coverage all from a single device. This greatly simplifies logistics and distribution and lowers the cost of global IoT deployments. In the decade ahead, the Industrial Internet of Things (IIoT) market value is expected to exceed $195 billion (€167.26 billion), transforming manufacturing, energy, transportation and many other sectors. Coined the 4thIndustrial Revolution, the IIoT relies on highly efficient, global connectivity solutions that can be easily deployed anywhere in the world. The new Gemalto Cinterion® PLS62-W IoT Module delivers highly efficient LTE Cat. 1 connectivity on all 12 LTE bands while providing seamless fallback to multi band 3G and 2G networks if 4G is not available. This allows device manufacturers and integrators to develop one application that can connect anywhere in the world, even when solutions move between different regions and cellular network standards. A powerful Java® embedded system included in the IoT Module adds processing power to IoT solutions. It makes application design easier and faster by sharing memory, a large library of existing open source code and recognised software building blocks. In addition, it simplifies lifecycle management and streamlines integration with back-end IT systems. An advanced power management system ensures reliability, and provides optimised sleep mode to preserve power and extend battery life. This is critical for remote industrial applications, a sector expected to reach 5.2 billion in by 2025. “Ideal for worldwide tracking and tracing, telematics and fleet management solutions, the Cinterion multi band LTE Cat. 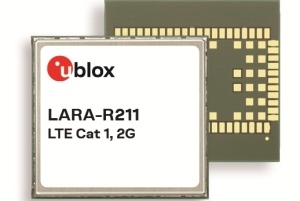 1 module with 3G, 2G fallback is a one stop shop for cellular IoT connectivity, no matter where your IoT solutions are deployed or where they move,” said Andreas Haegele, senior vice president IoT products at Gemalto.” The highly efficient Cinterion PLS62-W is perfectly suited for applications that need to operate across many different wireless network environments for many years.